This week I'm doing two chocolate reviews-- and look for my special post-Easter Cocoa Bella Easter Assortment review! I cannot wait. 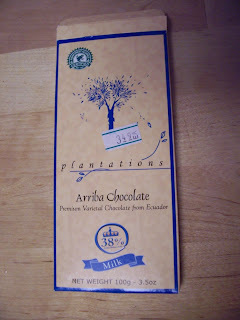 First up: plantations Arriba Chocolate, Premium Varietal from Ecuador, 38% Arriba Cacao, $3.49 for 100 g (3.5 oz). The back of the box tells us the Arriba varietal is grown solely in Ecuador with a perfumed floral scent before roasting. The pure flavor is preserved by not adding vegetable fat or "vanilla covering aroma." The box also tells us the chocolate has less cocoa butter fat and high cocoa solids content. Their mission is to safeguard heirloom chocolate varietals (here I was thinking only of tomatoes when I thought of heirloom varietals! 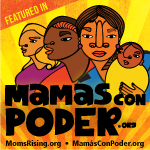 ); encourage sustainable shade grown cultivation, preserving the rain forest; and guarantee a fair price to farmers. This is an *extremely* pure bar in terms of politics and chocolate. I bought it because knowing that the business of coffee/chocolate growing can be downright sordid (we're talking child labor in bad conditions), I wanted to support those who grow these cash crops ethically (I'm not fooling myself into thinking this is some sort of staple! I savor.). You know how Central American coffees are generally pretty mild? They can be brewed strong, but they're not richly robust like French roast or Italian espressos. They're delicate, they can be overwhelmed by milk, and they're all around pretty gentle. This chocolate is like that. Mild, smooth (taste, not texture), with a delicate chocolate flavor. It's quite nice. My main quibble is with the texture. The box did warn me of this-- it said there was a lower cocoa butter content. The lower fat means the chocolate itself isn't quite as smooth in texture as it could be. The texture is also somewhat light- not totally, but somewhat suggestive of a crumbly texture you might expect with the lower cocoa fat content. I was a little disappointed with that. 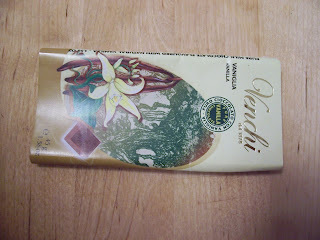 Next we have Venchi, Vaniglia chocolate. $2.99 for 45 g (1.58 oz). Milk chocolate flavored with natural vanilla. 31.7% cocoa. Wha-? you might ask. Why have a fine *chocolate* that's flavored with *vanilla*? Especially since we read above an implication that vanilla might simply be used as a "covering aroma"? Well, it's done pretty often, but usually with inferior vanilla. This, however, is no inferior chocolate OR inferior vanilla. The first bite releases the MOST heavenly, pure vanilla scent. This isn't bourbon vanilla-- it's as if someone scraped a precious vanilla bean into the chocolate minutes before your first bite. It's that pure and good. The vanilla clearly isn't meant to merely stand by as chocolate takes the lead. The makers of this chocolate intended for Vanilla to be The Flavor, with chocolate carrying and complementing it. They did an admirable job. The texture is totally smooth and melts in your mouth without being gritty or waxy, the two most common offenses I've found in chocolate texture. I did find that it's best to eat this little bar in even littler bites. The more you eat, the more the vanilla starts to overwhelm. So savor this one in small portions, and you'll get the most enjoyment out of it.